Tunisia is one of the most homogeneous of the Maghreb states in terms of languages spoken by ts people, with the vast majority using Tunisian Arabic. 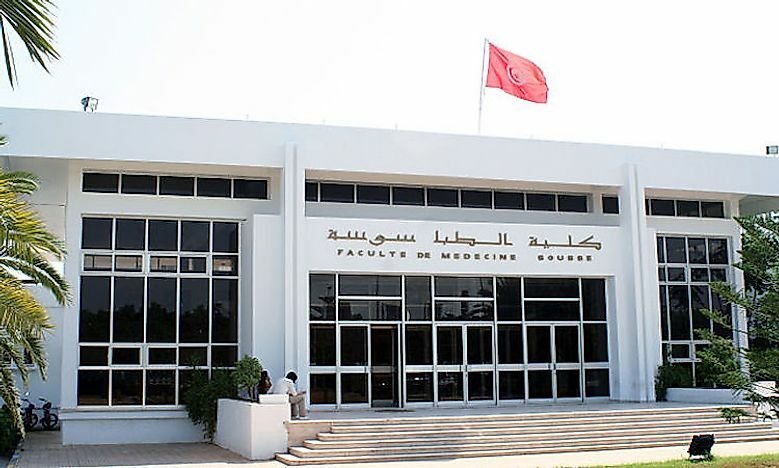 Sign in Arabic and French at the Sousse Faculty of Medicine in Tunisia. The northernmost African country, Tunisia covers a land area of 165,000 square km. Algeria borders the country to the west, Libya to the southeast, and the Mediterranean Sea lies to the east and north. As per the estimates of 2014, 11 million people resided in the country. Arabs, Berbers, and Turks are the three main ethnic groups in Tunisia. Other people who have migrated to the country at different points of time include the Greeks, Romans, Jews, Phoenicians, and the French people. Though at first there was a clear difference between the elite Turkish speaking elite population and the Arabic-speaking mass, by 1870 the distinction had blurred. Soon, the majority of the population identified themselves as Arabs. A small (about 1%) of the population living in the Dahar and Khroumire mountainous regions in the country identify themselves as purely Berber. A large number of Europeans started arriving in the country since the late 19th century, but many of them left the country after Tunisia’s independence. Thus, the large number of migrations that took place in Tunisia’s history contributed to the linguistic wealth of the country. Some of the major languages spoken in the country are mentioned below. The official language of Tunisia is Literary Arabic. It is a pluricentric language (a language with several standard versions). It is the literary variety of the Arabic language and is used in formal speech and writing in Tunisia. The Tunisian Darija or the Tunisian Arabic is basically a set of dialects that has no formal body or standards. The language evolved through the years and has been influenced by the various settlers in Tunisia. Today, it is the national language in Tunisia. The Tunisian Arabic is based on a substratum of Berber and Punic and is influenced by Arabic, Turkish, Spanish, French, and Italian languages. Although Tunisian Arabic is intelligible to speakers of other Maghrebi dialects, it is hardly understood by the Middle Eastern Arabic speakers. The language is closely related to the Maltese language. Berber languages, a branch of the Afroasiatic family of languages, are the main minority languages in Tunisia and are spoken by less than 1% of the Tunisian population. This population is concentrated primarily in the semi-Berber villages in the south of the country and on the Djerba island villages. French, English, and Italian are the main foreign languages spoken in Tunisia. The proximity of the country to Europe has popularized European languages in the country. A significant population in Tunisia also speaks Turkish. Though French was heavily popularized in Tunisia during the French protectorate of Tunisia, the dominant role of the language was gradually replaced by the Arabic languages after the independence of the country. However, education systems and administrative operations in Tunisia still use French along with Literary Arabic. Despite the promotion of Arabic languages in the country, a good knowledge of French is still regarded as an important social marker. French is heavily used by the intellectuals, business community, and scientists of the Tunisian society.